The Feast of the Epiphany, celebrated January 6 with a national holiday in Italy, and the tradition of La Befana are a big part of Italian Christmas celebrations. Epiphany commemorates the 12th day of Christmas when the three Wise Men arrived at the manger bearing gifts for Baby Jesus. The traditional Christmas holiday season in Italy lasts through Epiphany. 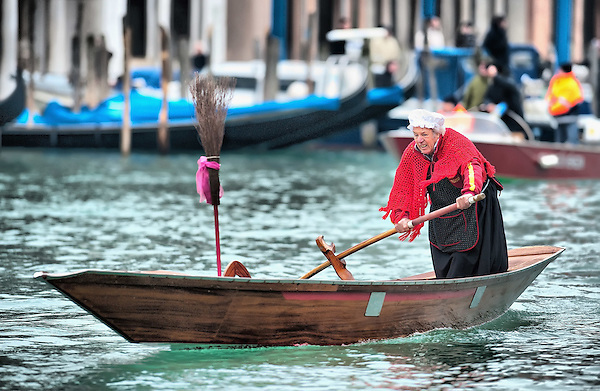 On Venice’s Grand Canal, at 11 c'clock men dressed as old witches – ‘befane’ in Italian – race towards the Rialto Bridge, standing up as they row Venetian style. This event takes place every year in January in celebration of Epiphany.